Physically, my running isn't in all that bad of shape right now. On Monday I accidentally locked myself out of my house with just a water bottle, a cell phone, and $7 in cash. Since there was little else I could do until Beat got home, I extended my planned six-mile run into a climby from-home loop I call the "Big PG&E," which has about 2,300 feet of climbing and comes in at exactly 13.1 miles. My half-marathon "PR" is 2:04, and I was able to wrap up this trail run in 2:21 without pushing any boundaries. I could say it went well — no leg pain, no more breathing trouble, happy feet, nothing out of the ordinary. Still, I wasn't quite feeling it. What can I say? Bryce Canyon beat me down. Ever since that race, I have felt a growing sense of terror about Petite Trotte a Leon, to the point where I'm starting to have PTL-specific nightmares. All of these nightmares involve a brilliant lightning storm and heavy rain on a high mountain ridge, and my two teammates and I are separated on opposite ledges with a huge chasm between us. Then I wake up in a cold sweat. To be honest, I haven't had nightmares about an event I haven't yet participated in since before the 2008 Iditarod. I'd almost forgotten how having this degree of pre-race jitters feels, but it's kind of awful. I'm not sure how I'm going to stave off panic as the race gets closer — and I think it's affecting how I feel about running in general. But while I struggle to capture my badly wounded running mojo, I've found relief in what has become a darker corner of my outdoor hobbies — road biking. I'm loving road biking right now. Ah, the effortless descents. The steady red-line heart rate of a hard climb. The smooth, flowing lines and leg-pumping flats. I go through phases with road biking; generally a few weeks of loving it until I get mentally worn down by run-ins with traffic, or distracted by deeper outdoor adventures. But right now, it's perfect, it's pressure-free, and it's just what I need. 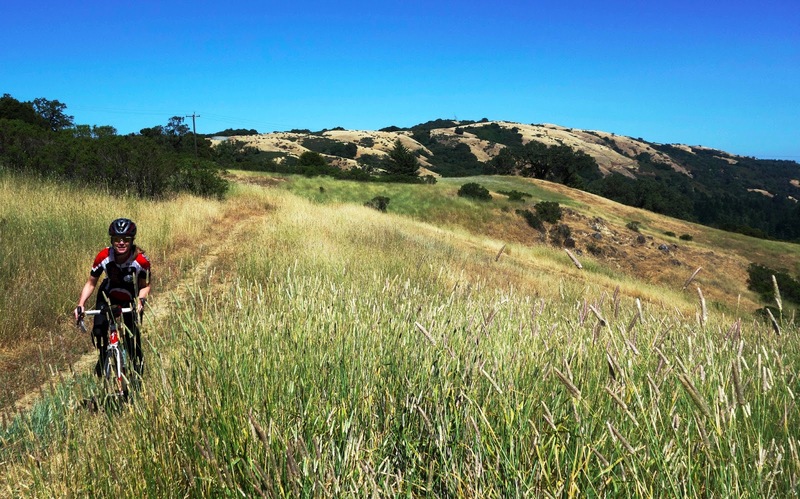 Today I rode a favorite loop — up Steven's Creek Canyon to Highway 9, along Skyline, down Page Mill, back with a wicked tailwind on Foothill. It's 32 miles with 3,300 feet of climbing, and covers a lot of scenic ground in a mere two hours and 15 minutes. 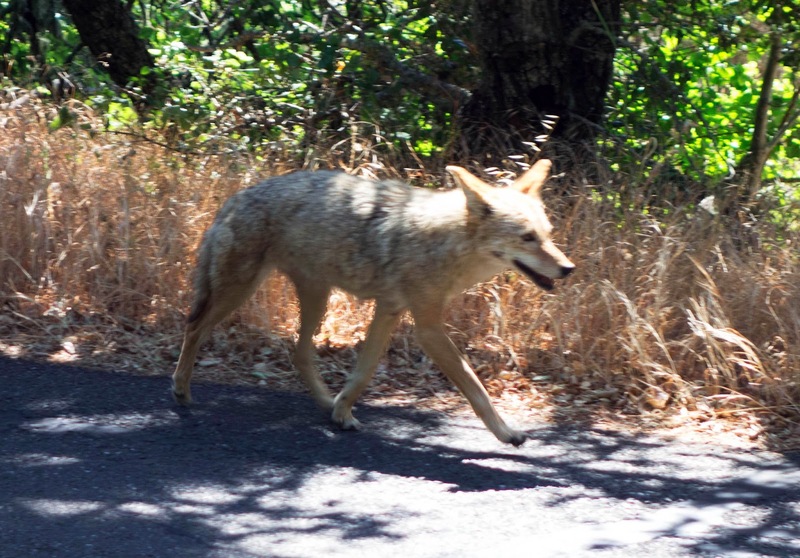 As I was coasting down Page Mill, I came up behind a coyote who was just sauntering down the road, pausing briefly to sniff the grass before continuing on. 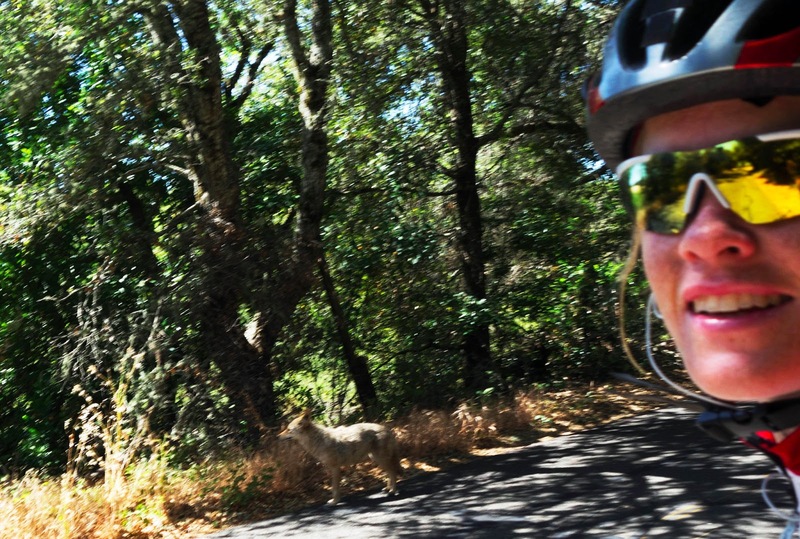 Even as I pedaled up beside it, Coyote paid me little regard. "Hey Coyote," I said, "How's it going?" I thought it would run away once I started talking to it, but Coyote don't care. Coyote don't give a @$%. Yeah, Coyote and I are good friends. I pulled out my camera and we rode/strode side by side for the better part of a quarter mile before Coyote's ears perked up and it stopped in its tracks. I stopped too and that's when I heard rusting in the grass. Coyote didn't waste another second; it pounced into the shoulder and chased whatever was rustling (probably a rabbit) behind the trees and out of sight. Ah, well. It was a fun friendship while it lasted. Maybe visualization would help with your pre-race jitters and nightmares. I'm sure you already know this, but in your mind picture yourself doing well and feeling good. I'm sure you're going to do great. You are so tenacious that nothing can stop you from reaching your goals, even if it's just to have fun! It's really a once in a lifetime dream and something most people will never get to do. l get the apprehension, because I get it when I get random aches and pains and I think about a show stopping injury on the pct. But break it down to what is the worst that can happen, and you know you can deal. You crossed remote parts of Alaska on foot. in winter. "I'm loving road biking right now." Having stumbled onto your site when you were in Alaska, and being a passionate cyclist, I figured you'd get the road cycling bug eventually. To me, a mt. biker and cross rider, road cycling is the pure stuff. May I humbly suggest you get in with a group of evenly matched cyclists on a flattish road and learn the intricacies of a fast circular pace line? A very engaging and rewarding activity. I was actually wondering if you were having PTL nerves since you haven't been posting as much as you used to. It's interesting since it usually seem to be at your happiest and most focused when you have a huge goal to work towards. It probably doesn't seem tempting to get up high right now, but how about visiting the Sierra and running some beautiful routes among peaks and lakes that can remind you what it's all about? Hey Jill, I just found your blog and am loving it! This post is great. I'm moving to rural Alaska in August and am ready for the journey of a lifetime. Your experiences are really inspirational. I'm starting an Alaska blog too. Check it out! Mary — yeah, I sign on for these kinds of endeavors that are way beyond my comfort zone because I love the freedom, the challenge, the exhilaration of the unknown. I accept that fear and apprehension is an unavoidable side effect. I think my biggest fear about PTL is the fact that it is a team effort, and so on some level there are others that will depend on me, and not all of the decisions will be my own. To be honest, I wish I had just held out for the Tor des Geants lottery, but then again it will be an intriguing experience to work with others on the razor point. There's also the fear that I may be pushed so far out of my comfort zone that bad decisions will be made. But, at the very worst, we formed a team of three precisely so one of us could drop from the race and not stop the whole team (a minimum of two is required to continue.) So if I get injured, or if the team decides to go up a pass in a horrific thunderstorm like the one in my dream, then I'll drop. But Ingunn — you're right, I am happiest when I have a big outlandish adventure on the horizon. Behind all the anxiety is genuine excitement. Climbing steep mountains is my favorite activity, and that's half of PTL! (The other half is, of course, descending, which I don't love but can tolerate at the slow speeds the duration of this race demands.) I'm hoping to get into the Sierras in mid-July for a shakedown trip. And of course there's Iceland in August, which I'm purely excited for an not scared about at all, mainly because PTL fear crowds out everything else. PTL will be perfect for you. No worries :-) What is your summer schedule again? A reference to the Honey Badger - love it! Popped over here looking for some TDR 2013 commentary. Two things Jill : read your book (Be Brave Be Strong) recently and found it inspirational. Also, grazing through your blog you seem to be doing a lot of running for someone who is essentially a cyclist. Running is harder on the body. Glad to see you finding the road bike as well. It will build you up, not tear you down. Again, thanks for the inspiration to get me out on my own bike(s)/trails more often. 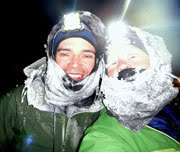 Skylab — If you're interested, I'm doing some Tour Divide reporting over at my endurance blog, halfpastdone.com. Thanks Jill. Wow! What a fast race this year!